The sight of all desks occupied, and a class of 40 students has become a common scenario in many classes. However, the overfilled classrooms have the possibility of expanding with the new Superintendent, Austin Beutner’s vision for classrooms. It can be expected to be as high as 50 students per a teacher. This is one of the many factors that the United Teachers Los Angeles claims to be the cause for a potential strike. 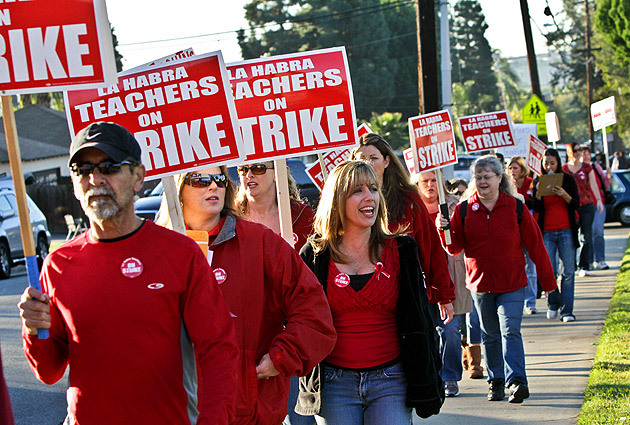 The UTLA and District are once again locked in a struggle of interests over the classroom. If the District does not compromise with the demands of the UTLA, a city-wide strike might be in the future of Los Angeles’ public schools. The polls opened in August for the voting of the authorization of a strike. Larger levels of approved participation in the strike, voted by teachers, would increase the bargaining power that the UTLA has and increase the chances of gaining more of a compromise on their requests for better teaching conditions. However, if the strike were to occur, teachers who participate would cease to perform duties such as grades, college recommendations, etc. and would not be payed during this strike period. Currently, the UTLA is in the mediation stage with the district, the last stage of struggle before a strike, where both parties try to find a solution; the UTLA claims that the district is stalling and has rejected their proposal to meet for mediation until Sept. 27, instead of the original date, Aug. 2. The UTLA claims to demand better conditions for teachers financially, and for the classroom as well. Some of the main requests include, a 6.5 percent pay raise, smaller class sizes, a larger staff in counselors, nurses, psychologists, librarians and custodians, charter school accountability, and resources. Currently, teachers pay for many of the organizational materials, classroom resources, some textbooks for world languages, and clean their own classrooms. “Our demands are reasonable,” Broyles said. Another concern of the UTLA is that public schools, in general, are losing funding to charter schools. Broyles notes that there is an influx of “problem” kids after the norm period (first five weeks of school) and before testing, increasing the size of schools, and depriving schools of yearly funds. Furthermore, kids with more special needs are being increasingly sent to public schools. Some of Beutner’s new claims and planned reforms, however, include: reduction of healthcare as funds to other priorities, 90 extra minutes of school per week, reduction of pension, and increasing class sizes. Although class size is restricted by section 1.5, the district has the ability to increase the size of classrooms if they claim financial hardship, no evidence is needed. These problems and their possible reforms depend on if the District will be swayed by the votes to strike, or if the District compromises. If the strike is authorized, students may see their own teachers actively fighting for what they claim are their rights. But the question is, how will this affect the students? What will the students do? Will they strike alongside the teachers, and will the district compromise? Or will conditions remain the same, and new reforms made to schools city-wide?